Here you'll find part two of our two-part series of 10 easy stuffed chicken breast recipes and cooking tips. For stuffed chicken breast recipes that are a little more traditional, you might want to try Broccoli Stuffed Chicken Breast, Two-Cheese Stuffed Chicken Breast Recipe or Bacon And Cheese Stuffed Chicken Breast Recipe. For one of our stuffed chicken breast recipes baked to sweet perfection, we recommend the Apple Stuffed Chicken Breast Recipe, perfect for the winter weather! To find out how long to cook stuffed chicken breast recipes, read each of them individually, as times may vary. 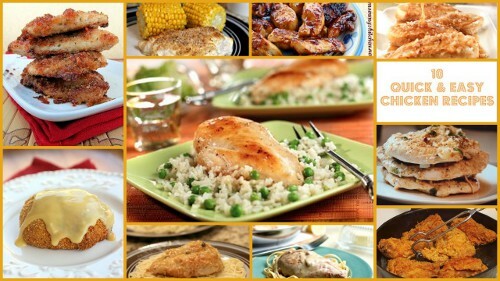 For other easy stuffed chicken breast recipes, check out RecipeLion.com for selections such as grilled stuffed chicken breast recipes. There's a wide selection! For part 1 of the two-part series, see 10 Easy Stuffed Chicken Breast Recipes And Cooking Tips Part 1! Broccoli Stuffed Chicken Breast - This broccoli stuffed chicken breast is packed with diverse flavors from ham, Monterey Jack cheese, green onions and of course, broccoli! It's a high-protein stuffed chicken breasts recipe that is sure to please your family at the dinner table. 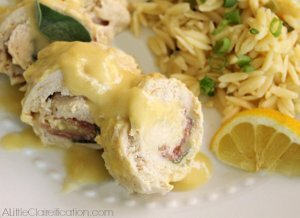 Bacon And Cheese Stuffed Chicken Breast Recipe - This bacon and cheese stuffed chicken breast recipe is a hearty recipe, packed with tasty bacon and melted cheese. It's a perfect dish for a cold night, or can even be a playful breakfast dish. Creamy Slow Cooker Chicken Saltimbocca (shown above) - Chicken breasts are stuffed with fresh sage, prosciutto and cheese in this stuffed chicken recipe. Let it cook in the slow cooker until all the flavors meld together and create a delicious Italian meal! Apple Fig Stuffed Chicken Breast (shown above) - Moist delicious chicken breasts are stuffed with apple-fig dressing and glazed with a sweet white wine and brown sugar applesauce in this elegant chicken recipe. Apple Stuffed Chicken Breast Recipe - Apple Stuffed Chicken Breast Recipe is one of the easier stuffed chicken breast recipes and is a sweet delight for the winter season. 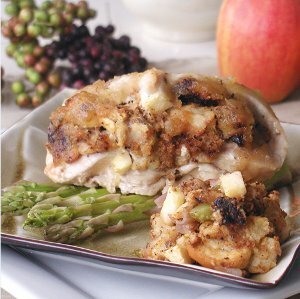 The apple flavor mixed with the savory chicken makes this stuffed chicken breast recipe a delicious one! Artichoke and Goat Cheese Stuffed Chicken Breasts - This may look like one of the more gourmet dishes, but it's an easy stuffed chicken breast recipes on the list. The chives, thyme and lemon zest pair perfectly with the mild goat cheese and the chicken. Applebee's Santa Fe Copycat Stuffed Chicken - Applebee's Santa Fe stuffed chicken is a restaurant favorite. With this copycat recipe it can also be an at-home favorite! Bring that neighborhood restaurant style into your kitchen with this popular stuffed chicken breasts dish. 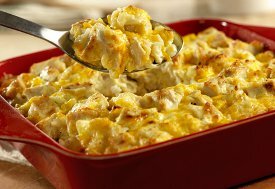 Find even more easy chicken recipes in our free eCookbook, 35 Quick and Easy Chicken Casserole Recipes.